Is your hot water heater is more than 10 years old? It might be time to consider a new one. The lifespan of a conventional storage hot water heater is between 10 and 15 years. After all those years of service, sediment build-up and corrosion inside the tank can take their toll. The Bradford White RG240S6X is a 40 gallon, short, hot water heater. It is a gas hot water heater that uses Liquid Propane and it features a shorter tank height than a typical hot water heater. A shorter height just means it is a little wider in diameter. This tank is 51 1/2" from the floor to the Flue Connection and the jacket diameter is 22" wide. Featuring an input of 35,000 BTUs, this hot water heater has a First Hour Rating or First Hour Delivery of 74 gallons. This household would probably want a hot water heater with a first hour rating of between 73 and 77 gallons. The Bradford White Defender Safety System is designed to be the safest, most reliable flammable vapor ignition resistant system in the industry meeting all the requirements set forth by the American National Standards Institute (ANSI). The Defender Safety System features ScreenLok Technology flame arrestor. 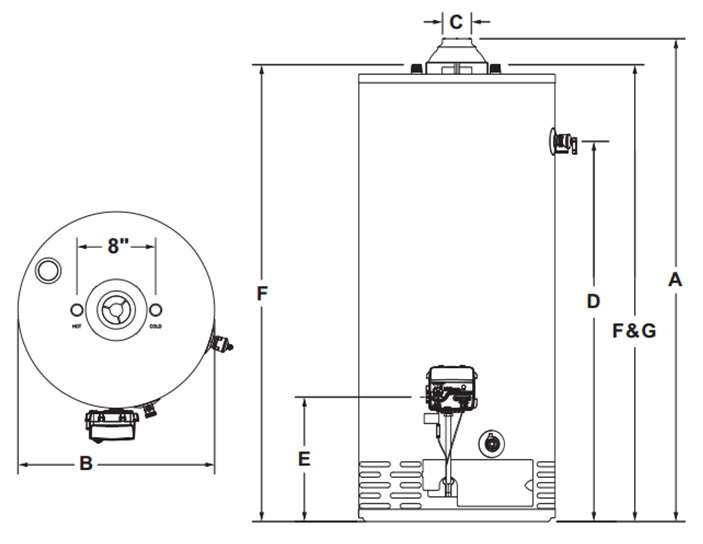 The louvered flame arrestor design increases the speed of incoming combustion air and creates a vector effect inside the combustion chamber when flammable vapors are ignited, preventing flames from traveling back through the flame arrestor and outside the water heater. Other features include Resettable thermal switch, virtually maintenance free and the Liquid Propane hot water heaters also included a Titanium Stainless Steel burner. A - Floor to Flue Connection: 51 1/2"
D - Floor to T&P Connection: 49 7/8" / 57"
F - Floor to Water Connection: 49 3/16"
G - Top T&P Connection: 49 3/16"